Main Street Crowd - Project: ColdSwitching - Learn Chinese! I'll add you to my email list and keep you up to date with progress! Early Access for You and Your Family! As a premier backer, I will give you personal Chinese language tutelage and make sure that all of my language learning resources, including ColdSwitching, are available to you. Do you know what the most effective way to start learning Chinese? How can we practice if we only know few words or sentences? By the way, ColdSwitching is my company name, but the language technique is actually technically called code-switching. ColdSwitching is that speakers switch between two or more languages in the context of a conversation. Would you like to try it out? Please carefully read the script below and write down your answers about the meaning of Chinese characters, but don't worry about the sound of Chinese characters right now! Uncle Sam: Hi, Mary, 这是TianMei. Mary: Hi, Tianmei, it's nice to meet 你.
Mary: Where do 你 come from? Mary: Which 部分 of China do you come from? Mary: what's the 名字 of your town? Mary: Is it 大 or small? Mary: What 食物 do you eat most often? Mary: How do you 烹饪 bamboo? TianMei: Boil 和 fry. Have you ever had bamboo? Mary: No, I've never had 竹笋. TianMei: It's really good. You should 试一下. Mary: I think I will try. Do you think that you have got the meaning of the Chinese characters above? Let's see, how many have you got them right? Now, you have figure out the meanings. Is it easy? Is it fun? 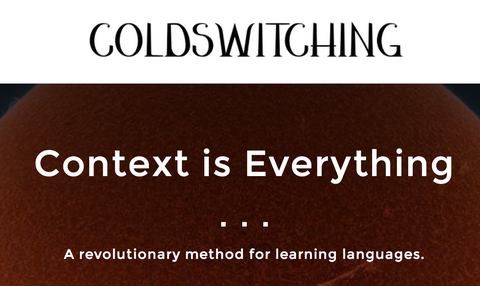 Remember, context is everything and code-switching makes learning meaningful and natural because ColdSwitching is a natural thing to do when you are bilingual, trilingual and multilingual. Next, do you want to know the sound of these Chinese characters? Do you think it'll be better when you are reading the Chinese characters, you can also hear their sound? If your answer is “yes”, would you like to help me to create audio picture books, dialogue books, store books and videos in learning Chinese through ColdSwitching? You are not only helping me, but also help yourself and other people who want to learn Chinese. Imagine one day, you are holding a book with lots of unknown Chinese characters in it; however, you don't need to check dictionary to find out their meaning or figure out their sound through your phone. You can just easily read it and listen to the sound whenever you want.